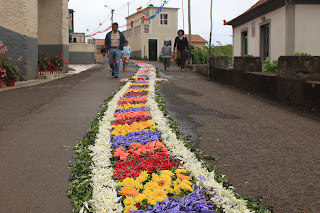 "If the priest walks on the flowers, I will leave the catholic church" Regula said as we were admiring the wonderful flower band the people of Santo had created on the street for the Festa Santíssimo Sacramento. Todays outing was to the north west corner of the island. The guide book had promised a breathtaking drive on the ancient coastal road, perched between heaven and sea on the sheer rock face. Unfortunately the coastal road has fallen into bad repair and in some places even straight into the sea. We ended up driving on the new road (yet another present from Brussels) that runs for maybe 30-40% inside the mountain, only peeking out every once in a while as it crosses deep valleys or provides access to a town. If you like tunnels you should definitely put Madeira onto your "must visit" list. Not only the northern coastal road often runs in tunnels, also the new motorway they built on the south side of the island. Even on our hike to the highest mountain of the island we walked through 6 tunnels that had been built a long time ago by the islanders to ease the passage through the mountains between the north and the south coast. But back to Santo. It seemed that the whole village was on the streets, creating a path about a kilometer long, consisting entirely of flowers. It was quite incredible. The beautiful flowers and all these people working together. The path was for the Santíssimo Sacramento procession. Soon after the last flower was properly positioned, the procession started, and naturally, the priest walked on the path. But since he was really careful and managed to walk without destroying all the nice patterns, Regula reconsidered and refrained from acting on her earlier outburst. Rome should send a commendation to the priest of Santo for one lamb saved. 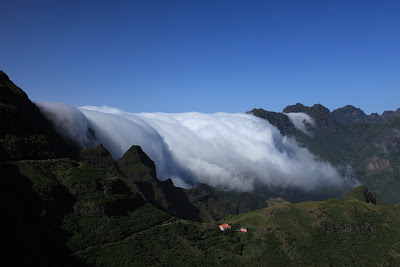 After Santo we drove across the Paul Da Serra plateau, out of the clouds into marvelous sunshine. We got a great view on that nasty mountain top cloud, it looks much better from the outside.